An innovative hard chrome plating process is the reversible rack, two bus bar system. This system combines the use of special racks, conforming anodes, and a spray rinse to provide increased productivity (up to six times), very even plating (variations can be less than 0.001 inch over a 6-foot length), high quality plating, and zero-discharge rinsing. The reversible rack is an integral part of the system. 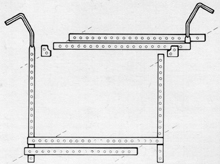 The rack is built as shown with the anode hook and the conforming anode mount insulated from the cathode hook and the "work piece" (cathode) mount. The insulated sections isolate the anode and cathode portions of the reversible rack. The result is that if the anode is mounted from the top and the work piece from the bottom, you incorporate ease of mounting, ease of reversing, and isolation of the part from the activities in the rest of the plating tank. You no longer require a course in imaginative C-clamp application for odd size pieces. You no longer require expensive reversing switches. You may now reverse a part in the same tank you are plating in without affecting the plating of the other parts, you may now plate three to five times as many parts in the same size tank. Process showing reversible rack and conforming anodes. The conforming anode is the second important part of the system. Basically the conforming anode is a mat of lead, shaped to surround or be inserted into the part with 1/2-inch clearance as optimum. Once the initial anode is produced it will be used over and over again for similar sized or shaped parts. 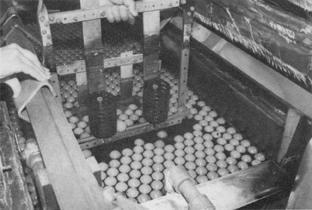 Benefits of this conforming anode configuration are increased plating rates (up to six times as great), uniformity in plating (variation less than 0.001 inch over a 6-foot length after a day of plating), less energy loss (not heating a lot of solution), and isolation of the part from effects of nearby operations in the same tank. Reversing may be accomplished next to a plating part.